Hundreds of Brands of Electric Cars are Coming to the Market in the Next Few Years. We are Ahead of the Game Again!, Building a Network of Active Dealers Worldwide. We are Now Providing Consultation Services for Qualified Auto Dealerships and can Place Your Company in a Chain of Distribution of New Cars. 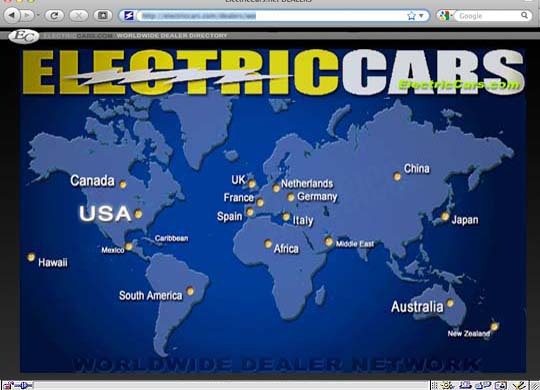 Our Website is the Center of This Massive Phase Out of Gas burning Vehicles. Since 1996 Our Company has been Working with Auto Makers in the USA, Europe and China and Guiding them to Build the Electric Cars Available Today and Coming Soon. Our Dealer Listings and Customer Contact system Generates thousands of Sales Leads we then Pass On to Our Active Franchise Dealers. We are Looking Toward Establishing Dealers that are Able to Invest in Inventory and Sell USA Made and Imported Electric Cars. Dealer Franchise Pricing is Available per Situation. There is Just a Small Consultation Fee to Get Started. Additional Consultations can be Provided on an Ongoing Basis. Fill out this form to take advantage of our dealershp franchise services. Legal requirements regarding participation will be conducted in compliance with standard USA laws and procedures per location. Which Models do You Currently Have Available? Which New Models do You Want Us to Provide Wholesale? Will You Provide a Demo for Evaluation? Copyright © 2019 ElectricCars.com. All rights reserved.